To restore the original shape and function of teeth. 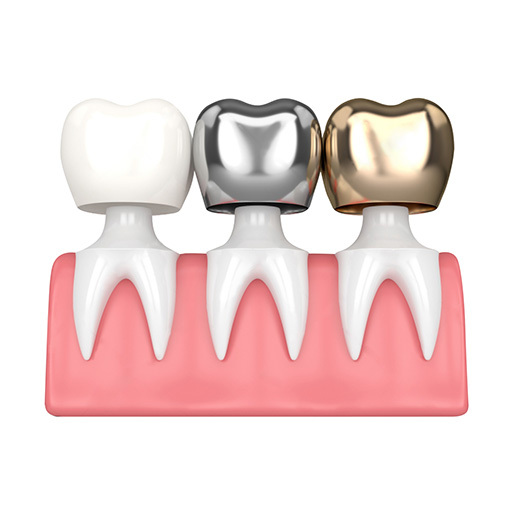 To improve the esthetics of teeth, such as shape, size and colour. To fix a bridge onto the teeth. To protect teeth from fracture.Tooth that has undergone root canal therapy andwith a large filling is more brittle. It can be protected from fracture when a crown is placed. With proper care, crowns normally last from eight to 12 years. However, with good oral hygiene, crowns typically enjoy higher life expectancy. It is important to clean between your crowns and teeth. Flossing is important to remove plaque from the crown area where the gum meets the tooth as it can cause dental decay and gum disease. Missing teeth impair proper speech and lowers aesthetic appeal. Besides dental implants, a bridge is another option that can help restore your smile. It is actually made of several crowns connected together. Sometimes called a fixed partial denture, a bridge replaces missing teeth with artificial teeth. In most cases, bridges are very natural and unnoticeable. They literally bridge the gap where one or more natural teeth may have been. Unlike a denture that you can remove for cleaning, only a dentist can remove a dental bridge.